Life is better with two dogs. Or that is how our family functions best. 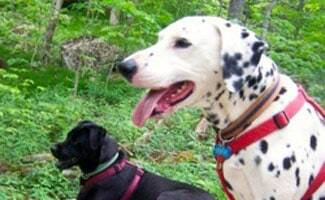 My first dog when I graduated from college was a Dalmatian named Domino. I adopted him when he was nine months old and enjoyed his companionship until a ripe age of nearly 14 years old. He traveled with me across the U.S., through just about every state, four times, but eventually, we settled in North Carolina where I bought my first home. With new home ownership came a sense of settling down and my desire for a second dog grew stronger. So I set out to find a dog in need of a home through various local rescue groups and shelters. A little black lab mix with an adorable underbite found his way into our hearts. His name was Storm, and he was about two years old. And this is where my love for the companionship of two dogs – for myself and for one another – grew into a must have in our home. Storm had had a tough life. His former owner would let him out the door to go to the bathroom but then forget about him for days. He would have to find his own dinner, safety and shelter. He was picked up by the local animal control several times. 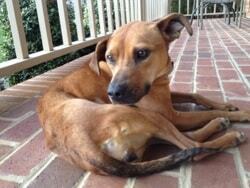 And each time he was treated for various health issues such as mange, ear infections, skin conditions, etc. Needless to say, when he came to our home he was not the most trusting nor the most loyal dog, but he seemed to want to be. When Domino and Storm first met they had a few tiffs, growling and staking their respective territories but in the end, they became fast friends for life. As Storm grew stronger and more confident in where his next meal was coming from, the look in his eyes changed from distracted and untrusting to one of pure love and confidence. He became a true member of the family and loved us and his new brother Domino unconditionally. But, it took time. And we had to grant him the time he needed to become comfortable with us and come to understand that this was his forever home. He was never hostile nor scared just unsure of whether we would be there the next day. Lucky for all of us we took the time we needed to find that trust and build an unbreakable relationship together. Brothers is what I would call the relationship between our two dogs and children is what I would call the relationship we had between my husband Alex and I with our two furry friends. 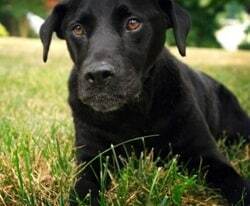 In fact, when Domino passed away just before his 14th birthday, Storm nearly fell apart. He stopped eating, he wouldn’t go to the bathroom and he sulked around like his world had ended. And in his defense, all of us were shaken to the core by this loss. Losing a pet, especially your first, is one of the hardest things any of us can ever go through. If you believe in the idea of someone having a “Lifetime Dog,” then Domino was most definitely mine. So I was not doing much better than Storm. When Domino passed away, we planned to wait a few months before adopting a second dog to allow ourselves to grieve. However, Storm reacted so strongly and so negatively to the loss that we quickly started searching for a new rescue dog to keep him and us company. 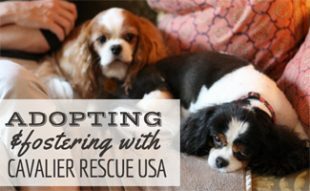 We searched online for days and visited every shelter and rescue organization within about a five-county radius of our home to find the perfect dog for us. You see Storm, while wonderful with other people, was a little picky when it came to other dogs, so we knew we needed to find a very gentle and submissive dog, probably female, to help nurture him back to the happy state of his brighter days. Our last stop was our local animal shelter, Forsyth County Animal Control. 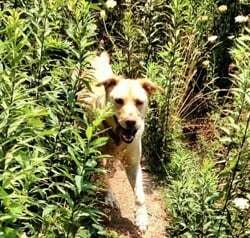 Here we found our Bella, a quirky and loving yellow lab mixed with who knows what but she seemed to be the perfect match for us from the moment we first met. Her calm and nurturing nature also made us confident that Storm would also welcome her into our home. And, again, the dogs had their moments of figuring stuff out and who was in charge of what, but about two days after Bella came home, Storm’s tail perked back up, he started eating again and everything went back to a more normal state in our household. Storm was about six years old at this time and Bella’s youthfulness at two years of age (or so) brought a new playfulness that was a healthy distraction for all of us. She fit in perfectly, right from the start, and has become a core member of our family. In August 2008, Storm was unexpectedly diagnosed with throat and tongue cancer at nine years old. It was incurable and had progressed to such a point that we only had a few days left with him. It was a devastating shock. We did our best to make the most of our last days by taking him and Bella hiking on Storm’s favorite trails and feeding him steaks that Alex custom grilled to perfection for each meal. It was a difficult time but also one that we will never forget, for a dog we will never forget. We love you, Stormie. Bella seemed to be fairly independent and doing okay with the loss of her brother at first. She also probably enjoyed the fact that we were spoiling her rotten by taking her on daily walks, hikes and giving her lots of rubs, attention and treats. However, after some time, and lots of work on Alex’s part to play the “substitute dog,” we started noticing that Bella wasn’t staying outdoors as long, and in general probably wasn’t getting as much exercise or fun time. And Alex may have been reading into this but could swear that he saw a little bit of loneliness in her eyes. So about six months after losing Storm, we decided that our home wasn’t quite complete without a second dog. Funny enough, one of our good friends, Alison, who is a photographer for the local dog shelter, started sending us photos and the stories of one of the dogs she had met during a recent photo shoot. (And her name was Bella, too.) Her story was quite sad. She had been chained up most of her life and essentially starved to the point where she was so malnourished and on the edge of death that animal control had actually forced the owner to turn her over to them. Luckily, despite all this abuse for her first four to five years on this earth, she was still loving and trusting of everyone. So she did well at the shelter and started gaining weight, slowly but surely. This story touched our heart and intrigued us. So we went to meet her. And when we did, we fell in love – just like Alison had anticipated and hoped we would. That afternoon we filled out the adoption papers and the next day we went to pick her up and bring her home. Once home, we named her Lily in honor of another rescue dog in Texas that we had fallen in love with as well as the hope of the spring season that was on the horizon. Bella welcomed Lily with open paws and they both started playing and enjoying one another, right from the start. Even though they were essentially the same age, Lily acted more like a puppy and that brought out Bella’s puppy spirit. It also brought out her mothering instincts to teach Lily how to live a normal dog life. How to explore the yard and all its interesting smells, play frisbee, climb stairs, and wrestle like Wild Kingdom is being filmed right in our living room. When we went for Lily’s one week check up at the vet’s office, we found that her health was a little worse than we had initially anticipated. No worries – everything was treatable but we definitely needed to take a little more caution with this malnourished pup. The good news is she had already gained two pounds in the one week we have had her and the vet was encouraged by her energy and obvious love for her new owners. So now we are treating Lily for ear infections, sore hips, and watching a few other skin conditions that may or may not be signs of slightly larger issues. But, everything is pointing towards health in another couple of weeks, as she continues to gain weight. We are encouraged and excited to see Lily growing to her full potential as the newest member of our family. We could not love her more and look forward to exploring many new adventures with her. Do you have a sweet rescue? Share your rescue story below. 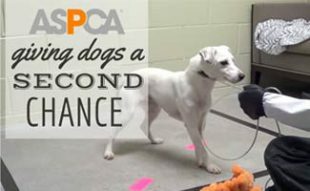 This is really such a terrific story, and a great read for anyone who hesitates to get a second dog. 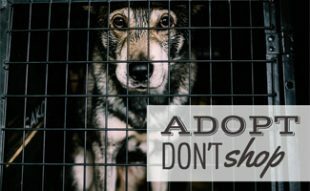 I was in that category until I heard there was an old shepherd languishing in the local shelter for five years (I thought THAT was a long time, until I heard about those that have been there for their whole lives). It really is a whole new ballgame with a second dog — you get to see so much more of your pets' personalities when they share their lives with a furry brother or sister. I'm so glad for that fateful conversation in the dog park that brought Wolf into our lives. I'm really happy for Lily — you just know this is a lucky dog, with parents who know what they're doing. Well done. I personally know Alex and Michelle and their furry children. 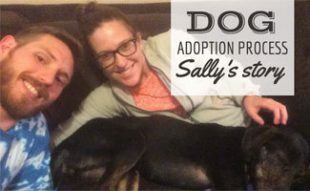 These babies have hit the forever home lottery when they chose this couple for their forever family. I can hardly wait to see Lily next week and see how she has progressed and to give those cookies to Bella and her new friend. I have two dogs of my own and I honestly don't know what I would do without them in my life. What a wonderful story — it brought tears to my eyes! Having rescue dogs myself, I applaud people like Michelle and Alex who make these dogs part of their family. Truly our four-legged children who ask nothing but to be loved in return for their unconditional love. …for your kind comments, Nancy! We'd love to hear your story about your rescue dogs and publish it on our site in May! If you're interested, please send a few photos and a short story to stories@caninejournal.com. Thanks for reading! Already planning to do so!